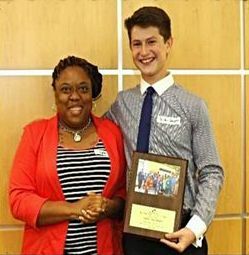 Congratulations to sophomore Jordan J. for being awarded Boys and Girls Clubs of the Florida Suncoast 2013-2014 PROGRAM VOLUNTEER OF THE YEAR! Jordan has logged countless hours volunteering and mentoring the Club kids at The Royal Theater. "His passion for working with our kids is remarkable, and we are lucky to have him as part of the BGCS family," says Club Director Kayren Lovett. Jordan also received a letter of congratulations from State Senator Jack Latvala. In addition to the service he does with Boys and Girls Clubs, Jordan recently started volunteering at All Children's Hospital.